Sunday Favorites is hosted by Chari @ Happy to Design. It is a great way to see some older posts that you may have missed before. And also a good way to post something with no work involved. What better place to have a meal with friends than at the Kingfisher Pub on the Fraser River. We are right beside the little ferry dock and if you look across the water you can see the ferry dock on the other side. IZ didn't make it for dinner due to the fact that he was on the other side in the line up and there he sat for two hours. I am happy to say that there is a new bridge opening in a couple of weeks and although we will have to pay a toll to cross there will be no more waits like these. Many people are sad to see the ferries stop running but not me. I would drive around many miles to get across rather than sit in that lineup. Soon it will be a 2 minute crossing. As the evening progressed the sun was setting and I couldn't think of a better place to be to have dinner with my coffee group. What a beautiful sunset! It looks so relaxing. Beautiful pictures and a great peaceful place to share with friends. Thay is a glorious sunset! I'd forget to eat while watching it. Thanks for sharing again - love the pictures. Wow can't believe our ferry is gone and the bridge is open - I haven't even travelled it once. Those are some gorgeous river shots!!! No WONDER you wanted to have dinner there. Reminds me of Hyacinth on the British sit com "Keeping Up Appearances" She was always trying to throw a "Riparian Dinner." Do you know what Riparian means? I didn't either until that show! hmm, the bridge must be open by now! I do enjoy the ferries....when one has the time! What a pretty river and I would hate hate hate to wait to cross - I have no patience, LOL ! So sorry that I'm so late in getting by, my friend...this weekend was just crazy busy for me and this is the first chance I've had to sit down at the computer! 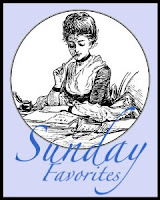 So happy to have you join in with Sunday Favorites again this week...what a great post! I love your beautiful Fraser River! Oooh, and the idea of a little pub right on the river sounds glorious! It certainly sounds like a perfect place to meet with a group of friends that's for certain! Hmmm...I don't know, the ferries sound so nostalgic...I would hate seeing them go, although I can certainly understand your thought...I would hate having to wait for that long as well!